In addition to incubators, setters and hatchers, AC ANG ENTERPRISES also offers: Consultation services on Breeding, Egg Production, Incubation and Hatchery Management for chick production Teach, orient and train farm staff and incubator/hatchery operator to achieve cutting edge incubator-hatchery performance. 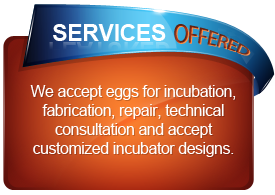 Repair and improvise design for all kinds and types of incubators and hatchers Sell controls, gauges and other accessories. Accept eggs for incubation.